Well, that was amazing. Really. 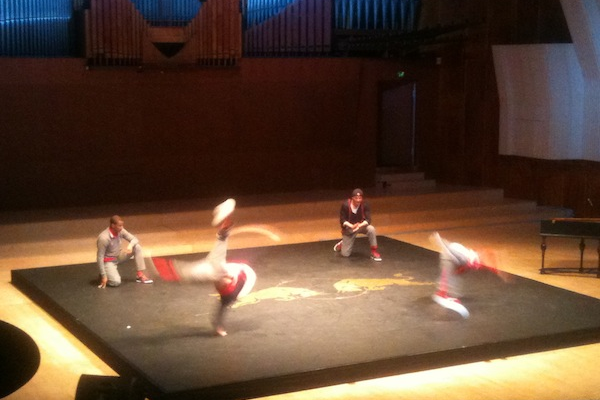 At first I thought: “Break dance and classical music, sounds nice. A good idea.” But when I saw what happened – It was more, way more. The production of Flying Bach was breathtaking, even mesmerizing. Haven’t seen such beautiful arts in a long time, especially live. Usually I go to a lot of concerts, to the movies but theater or musical? No, not that much. But maybe that changed now. It was not only the perfect combination of the two arts music and dance. It was also the combination of classical ballet and rough or modern street dance. The ballet dancer Sylvania Pen has such a gallant appearance, it is beautiful just to watch her throwing her legs through the air, jumping with a split across the stage and tipping on her toes to the beat of the piano. While the movements of the break dancers Flying Steps, such those of Lil Rock or Benny Kimoto, are in no way inferior to those of the ballet dancer. It is impressive how they can control their bodies. They are able to make movements you can’t even think of. But the best thing is how it all coalesces to an amazing fusion of art. The beautiful tunes of Bach’s piano, staged and played by Christoph Hagel, and the fine but still powerful movements on stage collide to a show of something special and unique. Here is the video from the show in Copenhagen, I visited with my girlfriend. It is nice but it doesn’t give a real insight to what it’s like seeing them on stage, it is sooo much better! Believe me! If you have any chance to see Red Bull Flying Bach, do it. You will definitely not regret it. Here you can see the dates and buy the tickets. Most of the shows are already sold out, understandably. I cant’t wait to see them in Düsseldorf. I like Red Bull, Classical Music and Breakdance. Best combination for me.